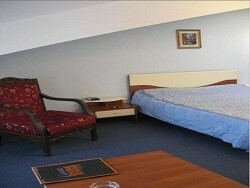 Hotel "GRAND HOTEL"European" is only a few minutes’ walk from the central avenue of Dnipropetrovsk. 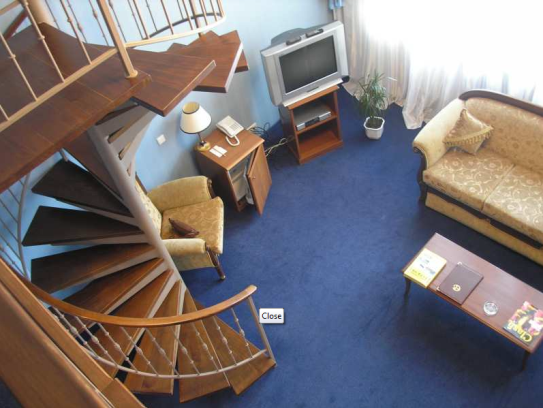 Convenient location, a classic interior, perfect European service, spacious and comfortable accommodation, excellent cuisine of hotel buffet and reasonable prices will make your stay comfortable and enjoyable. The hotel has 18 rooms in 3 categories, each of them has - double beds, air conditioning, minibars, safes, modern color television with access to 250 satellite channels, international direct dial telephone, Wi-Fi covering. For business meetings we offer to rent a conference room for 35 people. Renting one of our rooms, we can help you arrange a banquet or dinner for your colleagues or simply spend a pleasant evening with your family and friends with fine cuisine of your choice and taste. Large comfortable Standards will help you to have a perfect rest, and pleasing interior of the rooms will help you to get an impression of lightness and conveniences. All the rooms have double bed, air conditioning, refrigerator, lock boxes, satellite TV with 250 channels, telephone with distance and long distance connection. The hotel has 2 suites. Each - two rooms (living room and bedroom), double beds, air conditioning, minibars, safes, color television with access to 250 satellite channels, international direct dial telephone, covering Wi-Fi. Six rooms "Duplex" category will open their doors for professionals and businessmen alike. These duplex apartments have a satellite TV with 250 channels, telephone with distance and long distance connection, Internet connectivity, sporting trainers, refrigerators, air conditionings and safes. For business meetings we offer to rent a meeting room for 35 persons with the necessary equipment. 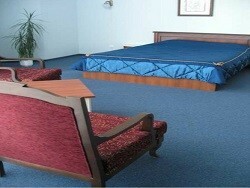 Hours’ worth renting the conference hall is 200 UAH. You can also order banquet, coffee break.